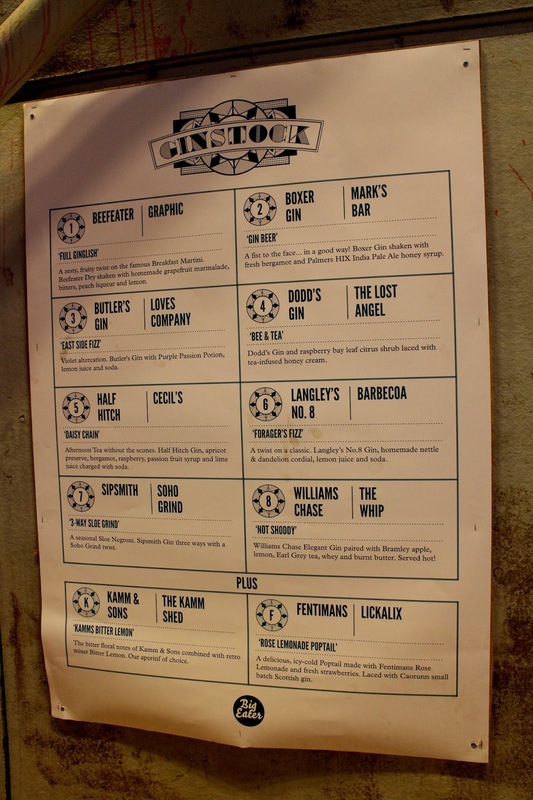 '8 Great bars, 8 Great Gins, One Great Day' - Tweatup's Ginstock was, as expected, a raving success. What follows is a picture laden photo diary of 6 gin-filled hours and a whole load of fun, games, new pals and a great big thank you to everybody who made the day pretty bloomin' brilliant. Listen out for whispers about next years event so you can put it in the diary immediately. Upon entry, we were all provided with our cocktail voting cards and plonked ourselves down at the table which was to be our base for the day. Seats claimed, we decided not to choose our cocktails in neat, numerical order, but instead go rogue and jelly bean about the room. Other than disrupting my sense of order, this method made absolutely no difference whatsoever. Some extraordinarily important calculations were completed and we concluded that we could comfortably get through everything if we spread our cocktails at a rate of one every 27 and a half minutes. No we didn't set a timer and yes we did totally ignore this calculation but what dya know, we made it to the end with plenty on time to spare! I have come to the conclusion that from now on nothing will ever quite be complete without an enormous tuba. While this is a total over exaggeration, there is definitely something to be said for swinging jazz and blues. I accept that the tuba is negligible. Up there with my favourite cocktails of the night was the negroni from Soho Grind and Sipsmith, which had a resoundingly delicious bitter twang. But the winner of the night was Loves Company and Butlers Gin with their East Side Fizz, expertly managing to transform this plastic cup into a thing of beauty. Special mention must go to the most entertaining pair of barmen in the entire event whose style (hello bowtie and outrageously dapper viking hat) was a clear cut above the rest. Cecil's, the hidden oriental speakeasy with a 1930s twist brought us a fruity bottled number, having teamed up with the peppery Half Hitch gin. Barbecoa made their match with Langley's gin and a subtle yet captivating nettle infusion and one of my favourite snaps of the day. 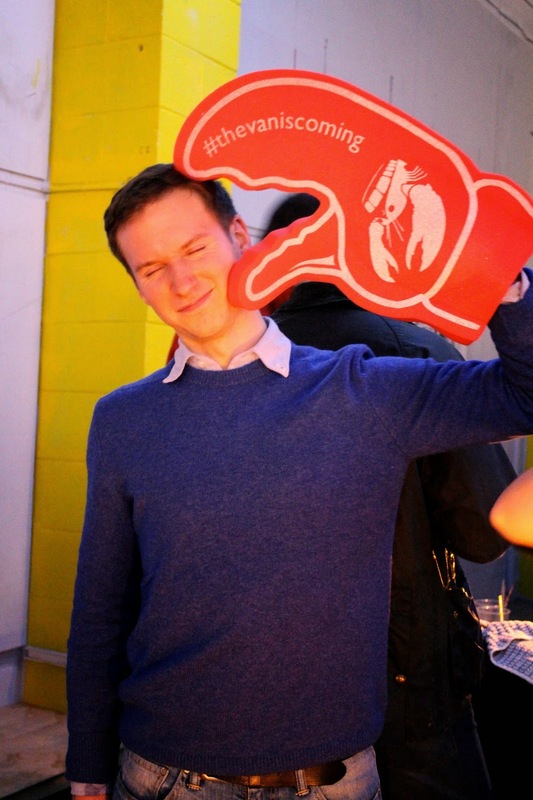 We had a couple of food related intermissions from all our sipping, which included the fluffy steamed Yum Buns, packed with hot 'cover-my-face-with-it' sticky sauce and tender pieces of meat. I took a minor break to finish my growing collection of cocktails I had been hoarding while I drunk at a snails pace. Being a pocket sized creature, this method proved excellent for maintaining my oh so charming character while having the desired skippy feeling inside. The bars all went to an incredible effort to deck out their stands to draw in the crowds. Some chose beautiful bottles, others chose beautiful barmen .. we all have our vice! The Kamm shack was showcasing Kamm & Sons, a uniquely bittersweet botanical spirit which has taken bar shelves all over the city by storm and certainly has my tastebuds tingling. Graphic and Beefeater met in a citrusy combination, served in a slightly awkward paper cone cup but with a welcome bite of shortbread and jam, balanced on one of the classic paint pots associated with the Soho bar. Continuing with the nibblets, The Lost Angel went all out and added miniature scones to the list. 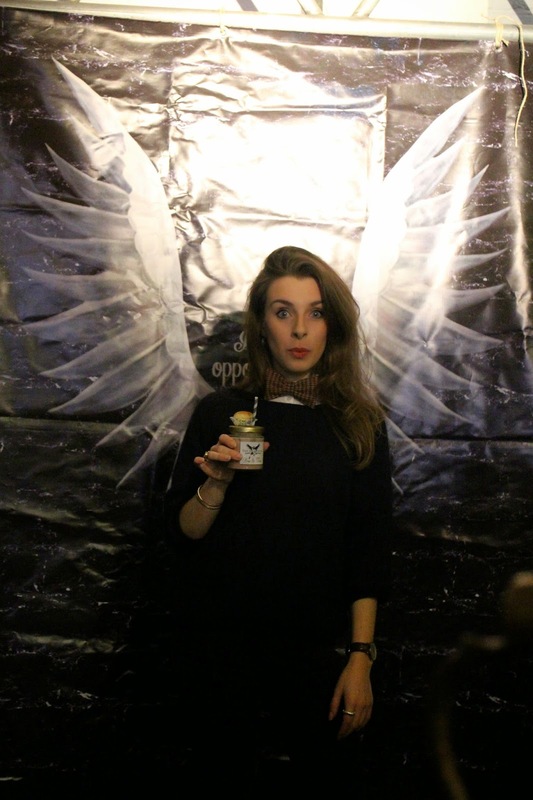 While my taste for the novelty of a cocktail in a jar was won over, the gin was somewhat masked by the thick, creaminess of the drink which was a shame, because the Dodds gin was one of my favourites of the event. There would never have been a situation where I'd miss receiving a huge pair of angel wings so this was a dream come true. Have you ever met an angel in a tweed bow tie? I think it's about time you did! And speaking of fantastic photo opportunities, this fellow looked as pretty as a picture in his new attire! As the day drew to a close and the DJ played the last beats of the night, congratulations rang out for Loves Company and Butlers Gin who were the winners of the day and took home with them the shiny silver gin goblet. Aside from the cocktail mastery, this cute little bar on Old Street also serves up an excellent array of cheese toasties. Next year, I'd love to see Opihr, Pickerings and Sacred Gin take to the floor with bars such as The Shop NW10, Discount Suit Company and my new firm favourite Bermondsey Arts Club. I shall leave you with an insightful last thought and urge you to get on board the gin train and join me next year! After going through your post I have decided to write a book too so that I could be able to have such a lavish launch of my book also.